There are certain vistas which challenge even the most established photographer, what more for an amateur like me. To attempt to capture the sense of feasting your sights on a paradise is like trying to describe a beautiful lady you just sighted. Words and images just do them no justice. There are certain wonderful places which most guide books deemed not worthy of putting their images in the section introducing said area. 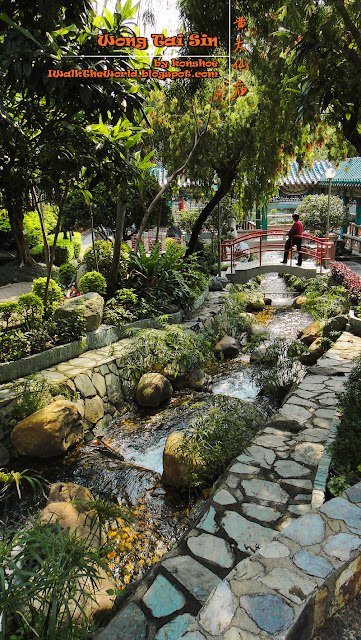 The backyard gardens of Wong Tai Sin temple is one of those. The garden which lied behind the main temple was a paradise unto itself, showing a harmony between the 5 elements. Upon exiting the rocky tunnel, a vista of unparalleled beauty greeted us, not unlike seeing the sun after years of crawling underground. What made the scene so profoundly beautiful was the short tunnel which brilliantly blocked most of the garden from the visitor's view until he chose to step past into paradise. 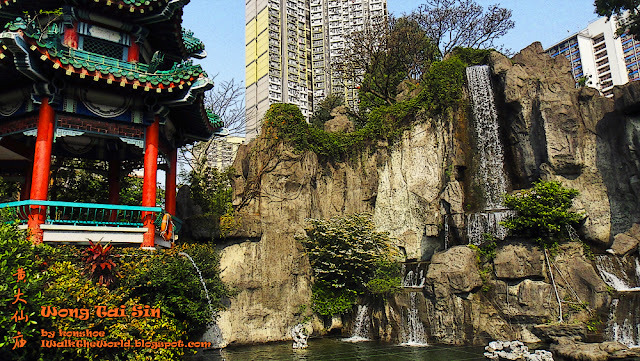 It was a memorable first visit to Wong Tai Sin Temple with a vista like this. 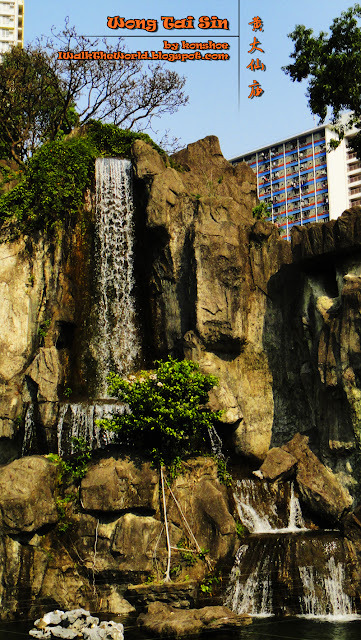 Rushing waters from the waterfall formed a contrast against the immobile rocks, all of which stood in start contrast against a backdrop of man made high rises. Readers are highly encouraged to click on the photo for a larger view. Another panoramic shot of the garden. At this angle, the other side of the garden is visible with its deliberate wildness arranged in harmony with the whole garden. The rushing waters of the waterfall are one of the few sounds of nature which we heard in the gardens, before being contaminated by more visitors and their boisterous noise. Looking at a large pond full of koi swimming languidly in the jade green waters sometimes makes me think: why so rush in life? A temple is not only a place for prayers; it is also a place for one to reflect on himself and search for his soul. 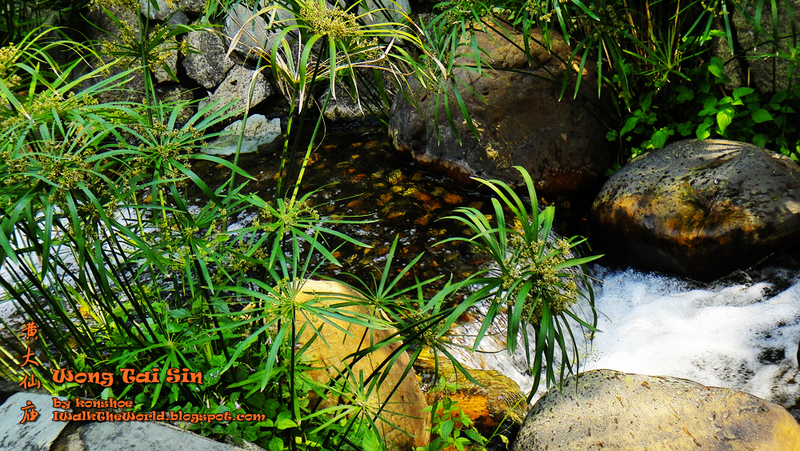 And where better to do that than in peaceful Eden, surrounded by the gurgling stream and whispering leaves. Such was the scenery impressed upon me that I thought of the temple surroundings which I had visited in the past. Were they not trying to offer something similar? The grounds around Hock Soon Temple of Teluk Intan were wild with unkempt grass, but was not the environment one of peace and harmony with nature? 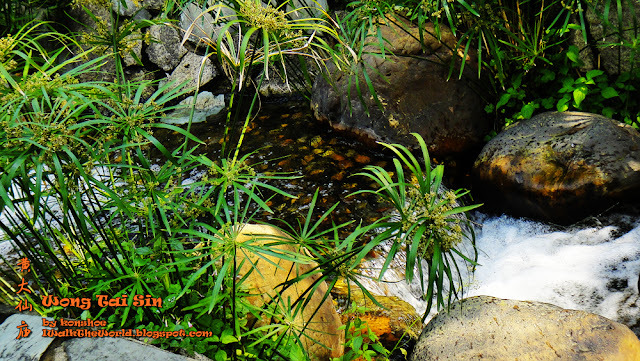 Gurgling waters rushing the stream whispered calmness to visitors, beckoning them to just enjoy each and every moment they spent in the gardens. 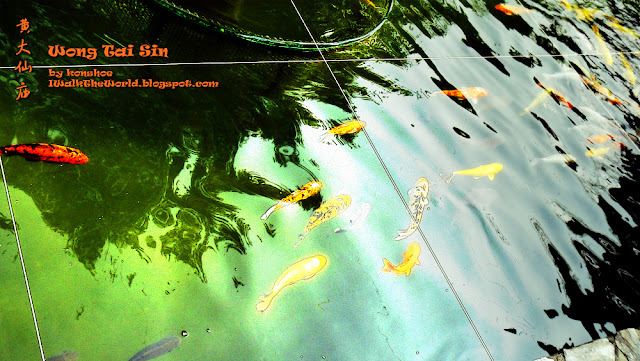 Suitable for: Pray for your wish for it to be granted, since that is what it is famous for. 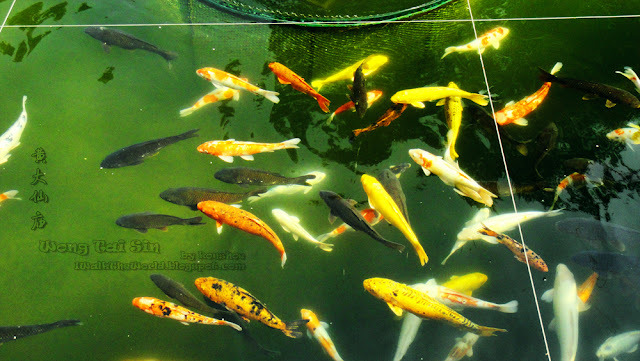 Opening Hours: (Temple) Daily 7.00a.m. - 5.30p.m. (Office) Daily 8.00a.m. - 5.30p.m. (Good Wish Garden) Daily 9.00a.m. - 4.30p.m. Getting there: Take the MTR to Wong Tai Sin station and exit. Follow the signs to the temple.